Cease-fire between Loyalists and Rebels; including Regime air strikes. Opening and sustaining much needed humanitarian corridors. Rebels to separate from Al-Qaeda linked radical groups. Possible: Cease-fire is not to enter effect in whole of Syria, but rather into hand-picked urban battlefields that lack aid, critical civilian situation. The truce has also been approved by the YPG but faced an ambiguous response from FSA, Ahrar ash-Sham trough official declarations. FSA, Anhrar ahs-Sham reject strikes on Jabhat Fateh al-Sham, but would largely support humanitarian efforts. They also feel stuck between a rock and a hard place, as Assad has become tolerated by opposing international actors, as Turkey and US; while the truce is not keeping the Regime under check. Reasonable concerns, as the Regime is known for its Russian-style cease-fire violations, attrition tactics and barrel bombs – while always under media concealment through denial or by labeling all opposition as “terrorist or Al-Qaeda”. 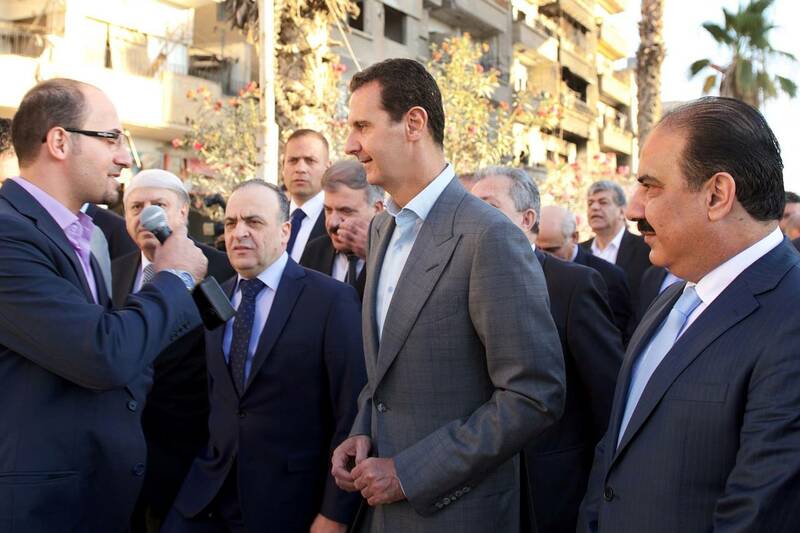 Moreover, Assad present at a prayer in Daraya, publicly stated that he would in fact continue his “without hesitation, regardless of any internal or external circumstances”. With cease-fire violations already happening in Syria, John Kerry has recently stated that “US, Russia could approve air strikes against Al-Qaeda linked groups in Syria.” Seems reasonable, but the only “catch” is that the Regime has been frequently using the “Al-Qaeda-linked” tag to strike on anything that moves from the Opposition. Some of the Opposition can indeed be blamed for working and cooperating with Jabhat Fateh al-Sham, no doubt, even if they don’t share their ideology. That’s because radical groups in Syria are the best armed, funded and equipped; having wealthy backers from the Gulf. It may be a sign that the idea of a “revolution” is fading away from the international agenda and in the same time, Assad’s makes his position immovable. And while for the US, it’s pivotally important to distance Al-Qaeda, isolate it and defeat it; for the Russians, it’s a simple divide et impera. Israeli Intelligence News “DEBKAFile” has informed that one of the private details of the CoH is Russia’s demand from the US to shut down its joint war-room with Israel, UAE and Saudi Arabia located in Jordan, and to move its military personnel in the Russian war room from the same state. Such a move would logistically downgrade operational capabilities in support of Rebels in the southern front, including Damascus. Israel and the Gulf States are supporting local rebels in their fight against the Government; denying them coordination with US directly at the Jordanian-Syrian border would be a blow, as said. It should be mentioned that without Ankara’s cooperation, the Regime’s current empowerment could not have been made so easily; but same can be said by Turkey’s safe-zone in north of the country. There are reasons to suspect that Turkey has been pursued by Damascus to downsize or completely cut its support for the Rebels in Aleppo city, so that in exchange, the Loyalists would tolerate the “Euphrates Shield” operation. In the southern front, the main players are the Gulf States and Israel. Jerusalem has already militarized the Golan Height to prevent any aggression from the Syrian War; especially that the Iranian-backed Regime is allied with Hezbollah, which is gaining weapons and capacity in this context. The fact that just A-list players, as US and Russia, agree on a deal, is simply not enough. The real tactical, operational, strategic enforcers are the ones who can really curve non-state actors or shift the trend on a front. Such actors are the Syrian Arab Army (Regime; Assad), Iran, Hezbollah; while on the opposite side, UAE, Qatar, Saudi Arabia (especially in the south front) and Turkey (northern front). While humanitarian aid is the only good thing it can come out from this deal, it should be kept in mind that Russia or Assad has no interest whatsoever to really provide safety to civilians, whom largely support the revolution and the overall anti-Assad effort. Russian Ministry of Defense is closer in achieving what Kremlin demanded some time ago; to bring international legitimacy to the Russian Federation, gain power-broker status and become an indispensable negotiator of the US in world affairs. Moscow speculated that the Obama Administration unilaterally lacks actionable solutions, thereby would respond to even the most sterile deals. Also, the White House desperately seeks any way to shift the war from a multi-sided civil conflict to a larger effort largely aimed on Da’esh. An objective best described as idealistic as unrealistic “wishful thinking” exercise, not with Russia as a partner, at least. After all, this is a deal reached with the same country that while eager to sit down for the Minsk Agreements, it also was totally unwilling to enforce it; just unilaterally against Ukraine. Ceasefires are a proven fact that they do not work with Russian presence on the ground. The lack of international designated and sanctioned observers on the ground is also a factor that contributes to the eventual fail of the proposed cease-fire. Besides, the exclusive A-player planning of the cessation of hostilities, the history of Syrian ceasefires, unrealistic demands from Rebels, de facto amnesty to Assad and trusting Russia, are just one of the main arguments towards a would-be strategic time-out rather than a genuine cease-fire. Abi-Habib, Maria, and Noam Raydan. “Syria Cease-Fire Begins After Assad Vows to Keep Fighting ‘Terrorists.’” Wall Street Journal, sec. World. http://www.wsj.com/articles/syrias-assad-swears-to-keep-fighting-terrorists-as-cease-fire-set-to-begin-1473693345. Barnard, Anne, and Rick Gladstone. “Syria Cease-Fire Is Violated After Less Than an Hour.” The New York Times. http://www.nytimes.com/2016/09/13/world/middleeast/hours-before-cease-fire-assad-vows-to-recover-every-area-in-syria.html. “Cease-Fire Underway in Syria.” Anadolu Agency.. http://aa.com.tr/en/middle-east/cease-fire-underway-in-syria/645440. “Confusion over Cease-Fire as US Walks Back Kerry Comments.” The Big Story. Accessed September 12, 2016. http://bigstory.ap.org/article/f9b036a477ff480eb50fe4fbe374b6d8/kerry-raises-possibility-us-approving-strikes-assad?utm_campaign=SocialFlow&utm_source=Twitter&utm_medium=AP. “Russia: Dissolve US-Arab-Israeli Syria War Room.”. http://www.debka.com/article/25658/Russia-Dissolve-US-Arab-Israeli-Syria-war-room?utm_source=twitterfeed&utm_medium=facebook. “Syria Ceasefire Takes Effect with Assad Emboldened, Opposition Wary.” Reuters. http://www.reuters.com/article/us-mideast-crisis-syria-idUSKCN11I1BX. “Syrian Islamists Reach out to the U.S., but Serious Issues Remain | Brookings Institution.” Brookings. https://www.brookings.edu/blog/markaz/2015/07/14/syrian-islamists-reach-out-to-the-u-s-but-serious-issues-remain/. “What the US-Russia Deal over Syria Means for the Rest of the World.” The Independent. http://www.independent.co.uk/news/world/middle-east/us-russia-syria-ceasefire-what-is-it-will-it-last-a7237406.html.